Find your perfect pair with the Kitchen Combination, featuring one of our favourite faucets matched with a best-selling sink. The Nola Pull-Down Faucet features an ergonomic dual-function sprayhead and top-quality components for maximum durability. The KHF200 33" Farmhouse Apron Sink is made with premium 16G T-304 stainless steel, and fully soundproofed with NoiseDefend technology. This combo comes with a matching soap dispenser. Experience Kraus Quality, and outfit your kitchen in style. Built to last, this captivating sink will completely renovate your kitchen's presence. The delicate handmade craft displays slender and elegant curves, which can integrate harmoniously with any kitchen arrangement. Its intrinsic design allows an ample and suitable bowl, concealed by a stunning front apron facade. This quality long-lasting sink is guaranteed to improve your everyday kitchen affairs. The Ancona Apron Single Bowl Sink is designed to be undermounted and will fit over most dishwashers and other cabinets. Add an elegant touch to your kitchen with unique Kraus kitchen combo. Kitchen Sink: Kraus kitchen sink boasts 16-gauge premium grade T-304 stainless steel construction with an 18/10 chromium/nickel composition. Scratch-resistant commercial-grade premium satin finish. Padded and Stone Guard undercoated insulation over a rubber pad reduces noise while sink is in use. 33 Inch. 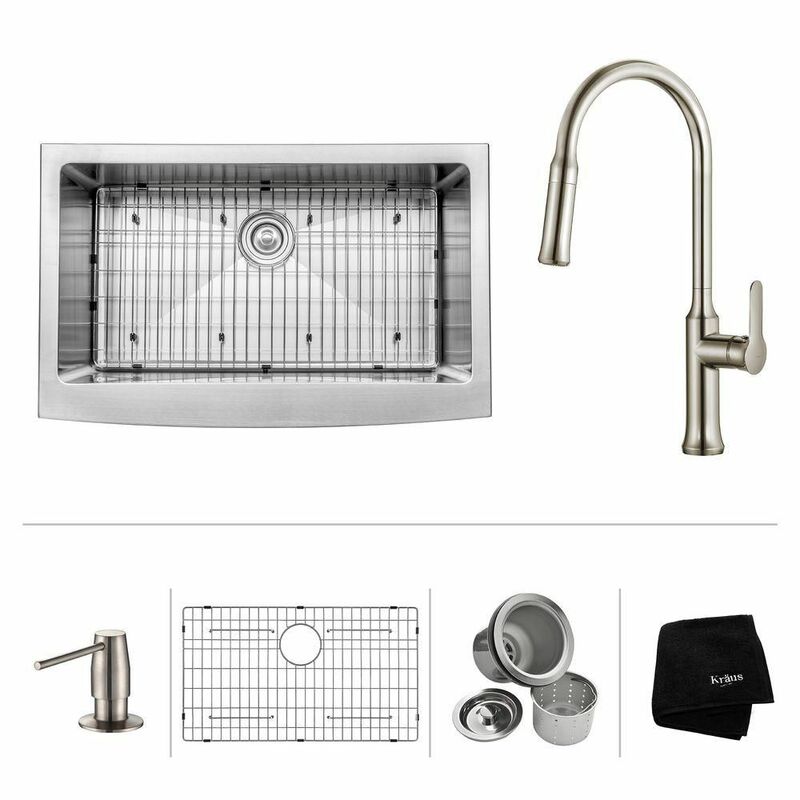 Apron Front Single Bowl SS Sink W/ Pull Down Faucet & SD Stainless Steel Find your perfect pair with the Kitchen Combination, featuring one of our favourite faucets matched with a best-selling sink. The Nola Pull-Down Faucet features an ergonomic dual-function sprayhead and top-quality components for maximum durability. The KHF200 33" Farmhouse Apron Sink is made with premium 16G T-304 stainless steel, and fully soundproofed with NoiseDefend technology. This combo comes with a matching soap dispenser. Experience Kraus Quality, and outfit your kitchen in style. 33 Inch. Apron Front Single Bowl SS Sink W/ Pull Down Faucet & SD Stainless Steel is rated 4.6 out of 5 by 5. Rated 5 out of 5 by Marika from Looks amazing Everyone who sees it loves this sink. Great value getting it as a set and the stainless steel seems durable and easy to keep clean. Rated 5 out of 5 by William from The farm house sink is exactly what my wife wanted.... The farm house sink is exactly what my wife wanted. Rated 4 out of 5 by Smitty from The sink is deep. The accessories are of good quality. Powerful water outlet. The sink is deep. The accessories are of good quality. Powerful water outlet. Rated 5 out of 5 by Ruby from It got here ON TIME!! In perfect condition! I didn’t... It got here ON TIME!! In perfect condition! I didn’t install it myself but had no complaints from the guy that did. It’s absolutely BEAUTIFUL!! I LOVE it! !